You know the symptoms all too well: body aches, fever, and extreme fatigue. It hits you hard, like a fully-loaded freight train, zapping your body of energy and draining you mentally. Ah yes, it’s that time of year again — the dreaded flu season. 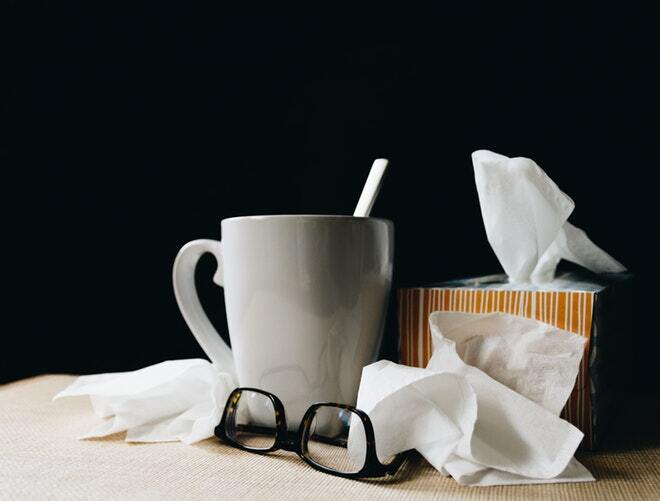 Professionals define the “season” as October – May; in other words, the summer months carry slightly lower risks of getting sick than other times of the year. Why is that? For most, summer is a carefree time—the temperatures are warmer, we tend to relax, we enjoy the outdoors and often take a vacation. Come Fall, we knuckle down—the kids are back in school (translation: young immune systems are bringing home a plethora of germs) professional workloads ramp up, we’re juggling busy family schedules, and stress levels rise. Combine this with pressures from the holidays, changes in weather and mental fatigue, and you’ve got a good recipe for getting sick. So, is getting the flu inevitable? No. Proactive prevention is possible; let’s take a look at your options. 1. Reduce your stress levels. When you’re stressed, your body releases cortisol, which lowers immunity. Feel stress coming on? Find some time for deep breathing exercises throughout the day. 2. Don’t skimp on sleep. After all, your body does most of its healing at night. 3. Take a probiotic supplement. Up to 80% of your immune system activity takes place in your gut—ensure yours is healthy. 4. Amp up your vitamin D. In the colder months, we’re less likely to get the recommended requirements of vitamin D; a high-quality supplement can give your system the boost it needs. Adults need around 5,000 IU of vitamin D each day, while children require about 1-2,000 IU, depending on age and weight. 6. Stay hydrated. Drink plenty of water and steer clear of sugary drinks like soda. 7. Exercise regularly. Active people are less likely to be sidelined with colds and flu. 8. Think about what you eat. A healthy diet is rich in fruits and vegetables, giving you the nutrients and phytonutrients your body needs to stay healthy. Once cold and flu symptoms hit, many people immediately reach for over-the-counter medications for relief. It’s understandable — after all, these drugs promise instant relief, and they’re everywhere. However, these medications come with several side effects, including dizziness, weakness, a headache, nausea, diarrhea, sleep problems, and more. These medications may not even effectively relieve your symptoms. Chiropractic care, in contrast, does not cover up the very symptoms that are meant to warn you that something is wrong. Instead, chiropractic care looks at the body as one interdependent system — because it is. In fact, because of how the systems of your body all work together, a chiropractic adjustment (gentle, strategic pressure on key parts of your body) noticeably improves your immune system’s function. Chiropractic therapy enables your body to fight germs naturally, without the use of drugs. Typically, when bacteria enters your system, your brain springs into action, telling your body how to fight it off. But, over time and compounded by stress, the muscles in your body begin to spasm and spinal bones can lock. The result is a misalignment in your spinal vertebrae. And when your spine is incorrectly aligned, your brain can’t send critical messages to your immune system, so you’re more likely to get sick. If you’re prone to illness and you don’t know why spinal misalignment could be the culprit. Chiropractic care restores your spinal alignment and immune system functionality, so your body can heal naturally and protect you from incoming germs. Each patient is different, and your experience will be unique. You deserve a medical team committed to treating you holistically, taking care to respect how the systems of the body all work together to keep you healthy. Chiropractic medicine gives your body the space to heal and do its job. Chiropractic care is covered by most insurance plans and is an investment in your mental and physical well-being. Make an appointment online or call our office at (949) 397-6699 for a comprehensive exam, before flu season impacts you. This article is for informational purposes only, and is not a substitute for in-person advice or care from a medical professional. Young children, the elderly, pregnant women, and those with chronic diseases or weakened immune systems should always consult a doctor if they’re experiencing flu-like symptoms.